Disappointing data on Chinese industrial output reignited concerns over the world’s second biggest economy. A brief rally in metals and commodities went into reverse Monday after data released last night showed that annual industrial output to August was just 6.1 percent. Markets were looking for a figure of around 6.4 percent. Output was at the bottom end of expectations and this adds to a slew of recent data showing that the Chinese economy is undergoing a protracted slowdown. Producer inflation data released last week also highlighted that factory prices are falling due to overcapacity and the drop in the cost of raw materials. Deflation combined with a slowing economy could prove to be a lethal combination. On the positive site retails sales number topped expectations as Chinese shoppers were more active in August. This boosted annual retail sales to 10.8 percent and up from last month’s figure of 10.5 percent. On balance markets were more risk-averse today following the factory data and given the meeting of the Federal Reserve this week. Brent crude futures tumbled another $2 on Monday taking the front month contract to just $46.4 per barrel. This came despite OPEC predicting that the oil surplus will be lower next year. Copper also fell sharply as traders factor-in lower demand going forwards. Commodity currencies stood well supported however but this comes after weeks of punishing losses. The Australian dollar held firm following strong employment figures released last week. AUD/USD extended a rebound from its bearish rally with a rise of 0.5 percent today. 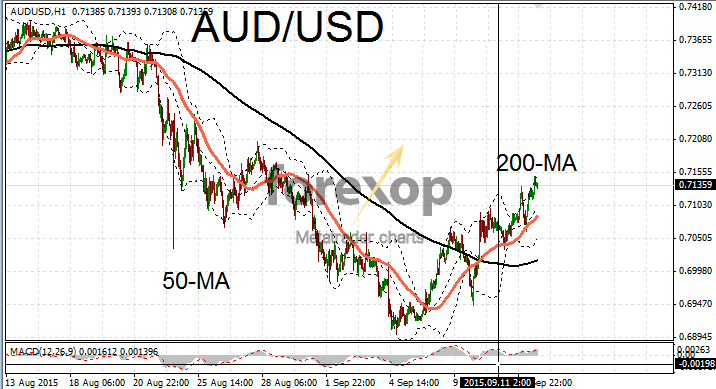 AUD/USD is looking strong on the shorter time scales. Today’s move took the pair up to the mid-0.71 range. On the hourly charts (and below) the pair is trading bullishly above the pivot levels around the moving averages. The longer time frames still look vulnerable however as the fundamental headwinds remain in force. The “Aussie” also extended its rally against its New Zealand counterpart. 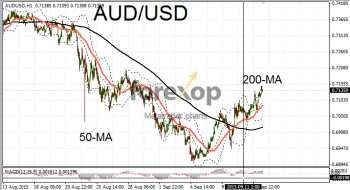 AUD/NZD is testing the top of a sideways moving channel. Traders were more bullish on the Aussie after encouraging data showing that non-mining sectors may be taking up the slack in the economy as the country’s mining industries diminish. Even so the New Zealand dollar, with its economy closely coupled with Australia’s received some uplift. At 0.6328 NZD/USD managed to scrape a tiny gain for the fourth day in a row. Both the kiwi and the Aussie were trading lower against the Japanese yen which strengthens characteristically as markets became more “risk wary”.